Die #3 review: This is the world – AiPT! The first issue of Die from Image Comics introduced readers to its cast and set in motion what was about to be seen. The second issue showed the characters of the comic and gave a glimpse of their powers in the world of Die. The central conflict was also introduced, along with some additional questions. The third issue begins the potentially lofty task of world building. One of the best things about role playing games is they can take you to any world. Dystopian futures, the farthest reaches of space, or even a reimagined look at the modern world. When most people think of RPGs, they tend to think of high fantasy; a world filled with wizards and warriors. The world readers are introduced to in Die #3 is a familiar one that never existed. 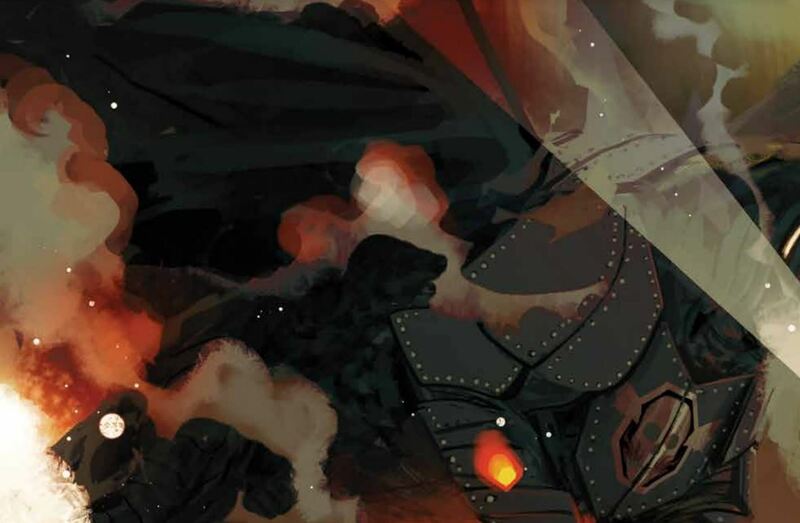 Die #3 establishes a world that is a mix of Tolkien and the real world. There is an ongoing war between familiar names (Eternal) Prussia and (Little) England. There are infantrymen with guns and trenches. Involved in this ongoing war are also dragons and wizards. It is a combination that mixes elements of fantasy with deep human emotion. Issue #3 is a very emotional issue. There are two very powerful moments in the book. The first part is when Ash takes refuge in a trench. The party has been split after an attack from a Prussian steel dragon. Along with the dragon there is a constant barrage that has made walking in the open impossible. What Ash has found in lonely trench may be far worse. Four Englishmen in varying states are also holed away in the same trench. The conversation between Ash and one of the men gives an idea as to how long the war has been going on but more importantly, adds a layer of emotion to the world. Die is a book that has always had a constant tone of dread and depression. Ash’s encounter makes it clear this depression is not limited to the book’s main characters. It is sobering to see a high fantasy setting that is far worse than our modern society. The final pages of the comic are also very poignant. There are some throwaway statements in the issue that allude to the class structure of Die. Characters discuss the importance of some while nonchalantly mentioning how irrelevant they are in the grand scheme of life. The dialogue can be seen as something that one particular person thinks. The last pages then confirm there is definitely a sense of entitlement in Die‘s world. It’s shocking, and will probably cause many readers to do a double take. Writer Kieron Gillen does his usual great job here. The world building and emotional beats would make for a great comic on their own, but the scripting is also very well done. Ash serves as Die‘s narrator with her thoughts. These moments give us an insight into Ash while progressing the story. The conversation in the trench is very natural. There are also nods to Tolkien and poetic moments that will impress many. Stephanie Hans’s art continues to impress. The dragon looks incredibly frightening and there are some great character designs. (It does not play into the greater narrative, but there is a figure in the very first panel that immediately draws readers in while also communicating the gravity of what is happening.) Readers are introduced to more of the races in Die‘s world. Many times fantasy stories will add characters seemingly for the sake of doing it. These will stand out due to the simply fact they just do not look right. This is not the case with Hans. Even more impressive is the detailed work in the facial expressions of the characters. Sadness is a constant, but Hans also does a great job of showing confidence, mocking playfulness, ruthlessness, and utter disdain. The highlight of the issue comes while Ash is in the trench. There is one beautiful panel in which a character talks about returning home. It conveys sadness, regret, and foolishness. It also seems the character has come to peace with a decision made. The panel looks great and is also very moving. Die #3 is an incredibly moving issue that does a great job of world building. The moments with Ash, the soldiers, and Matt are affecting moments. Stephanie Hans’s work continues to be the perfect fit for the story being told. Die is more than just another fantasy story. Can a story be too sad? If so, this may be it.